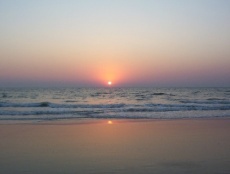 Fringed by the Arabian Sea, the state of Goa is best known for the beaches that adorn its coastline. A former Portuguese colony, its influence still makes itself felt in its churches and the laid-back, almost Mediterranean feel that is more relaxed than the rest of India. There is plenty more to experience & see besides the beaches and the numerous restaurants that serve up fresh fare on the sand. The cathedrals & churches of Old Goa, the back streets of Panjim, the Latin Quarter, the weekly Anjuna flea market where many a bargain can be struck being a few. Further afield the wildlife sanctuaries of Bondla, Molem and Cotigao where bison, rare birds, sambar, wild boar, porcupine and langur & bonnet monkeys can be spotted. The 13th century ruins of Hampi are around 7 hours from Goa. This beautiful and evocative ruin has a brooding and mystical ambience. 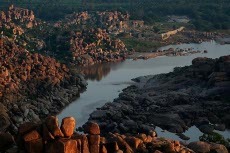 Bleak, barren and strewn with boulders, the magnificent remnants of Vijayanagara empire, one of the largest in the history of India. 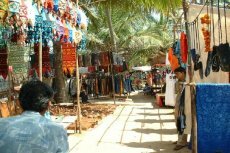 Every Wednesday a flea market is held behind the the beach which is the hub of Goa`s alternate scene and the place to indulge in a spot of souvenir shopping. A great place to just sit around and see the world go by. The silt banks and tidal waters of the Mandovi River are home to a small population of crocodiles known as `muggers`. Take trip along the Mandovi and Cumbarjua canal through the mangroves to spot the Indian mugger crocodiles in the marshes. Along with crocodiles one can also see abundance of bird life especially the rare white collared kingfishers. Stop over for lunch at an award winning spice plantation. Take a guided tour of a plantation and visit a spice-processing unit. Explore the Braganza place. The palace built in 1500 by the wealthy Braganza family spells the history of its Portuguese influence. 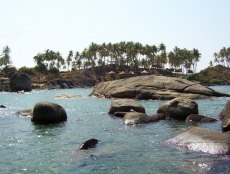 Also visit south Goa `Mount Chandreshwar` to see the ancient 2000 years Shiva Temple and there you have a bird`s eye view of the surrounding places. Drive to Taluka which the Portuguese conquered in the 17th century, visit the `PALACIO DO DEAO` which is 213 years old. 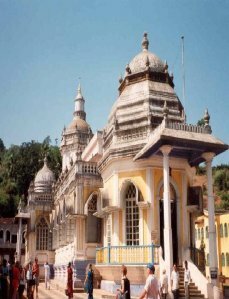 The Portuguese noble man who was the Dean of the church and the founder of Quepem town built it in an unusual style of architecture, blending Hindu and Portuguese culture. Also outstanding are its lush gardens that have managed to preserve their historical features and have since old times, been known as the most beautiful pleasure gardens in Goa. 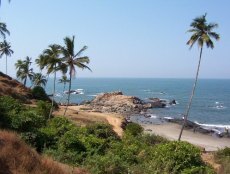 Get a feel of Goa`s ever-winding roads taking the coastal route passing sleepy villages, palatial houses, thatches, huts, churches & temples. Cross the river Sal and you are in Chinchinim. Learn how oyster shell powder is made used to whitewash houses. 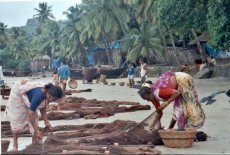 Check out Goa`s age old coir industry, get a spectacular view of the river flowing into the sea from a 15th century light house. Watch how toddy is tapped, fermented & distilled and get to taste the local liquor `feni`. Visit a rubber plantation and watch men tap the rubber tree to get latex. 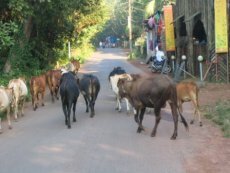 Visit a potters village, pass laterite stone quarries. Watch how rice powder and coconut oil, two essential ingredients in any Goan home is processed. An ideal day trip for all sun worshipers. A perfect day to top up your tan whilst cruising through the Arabian Sea. Spot dolphins and visit secluded beaches and ward off the heat with a cooling dip in the water. Snorkeling equipment and fishing rods available for hire. 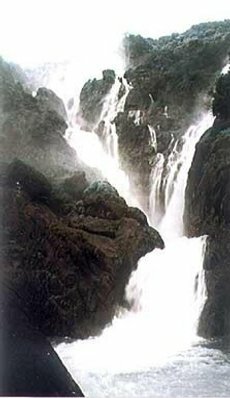 Measuring 600m from head to foot, the famous waterfalls at Dudhsagar are the second highest in India. Set amidst dramatic scenery making the jeep journey there is an unforgettable experience. Driving through remote villages and finally into the Bhagwan Mahavir wild life sanctuary to see the waterfalls. The dense vegetation of the Wild life Sanctuary houses a variety of birds, small animals and monkeys. Swim in the natural pool hemmed in by large boulders at the foot of the falls. Visit to the former capital of Goa `Old Goa` where the churches were built by the Portuguese. 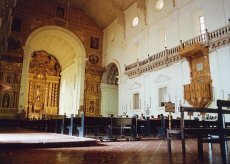 Visit the Basilica of Bom Jesus where the relics of St Francis Xavier been kept, later visit the Se Cathedral this church is the second biggest in Asia. The Shri Mangueshi Temple is set atop a hill at Priol, northwest of Ponda leading to Old Goa. The temple has a seven-storied lamp tower (which is a unique trait of Hindu temples in Goa), a Nandi bull (Lord Shiva`s conveyance), as well as shrines to Parvati and Lord Ganesha. During the festival of Mangesh Jatra, the rath (temple chariot) is pulled by several devotees. The Mahalsa Narayani Temple is dedicated to Lord Vishnu`s consort Laxmi, though some people believe it is the Lord Vishnu`s female form Mohini. A lamp tower, which is seven floors high, can also be found here. Drive to the spice plantation and take a guided tour followed by lunch. The scenic drive to this hidden location is an unforgettable experience in itself but nothing can quite prepare you for the beauty and the tranquility that awaits you. 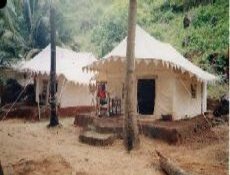 A number of beautifully hand-made tents from Rajasthan have been brought to the bottom of the hillside and these offer the opportunity to stay at this lovely place for a night or a few days. If you`re looking for the ultimate beach experience Cola will live up to your expectations of complete peace, relaxation and exotic beauty. Drive towards the Western Ghats into a camp within the Bhagwan Mahavir Wildlife Sanctuary. Enjoy an elephant ride, stay overnight in a tent and visit wayside villages, temples, waterfalls en route. 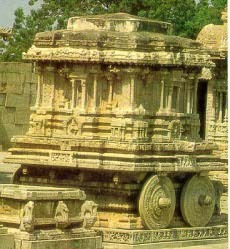 Take a train to Hospet where you can visit the ruined city of Vijayanagar `the City of Victory` also known as Hampi perhaps the most evocative of all ruins in Karnataka. Bleak, barren and strewn with boulders, the desolation offset by the magnificent remnants of a once powerful empire. Visit Hampi`s lively market. This exciting 4/12 Konkan railway train journey takes you from Margoa through remote and scenic villages to arrive at Udupi in Karnataka. Udupi is famous for the Krishna temple. 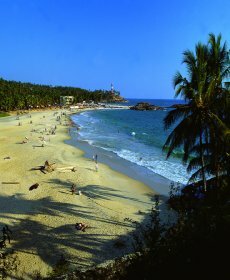 It also lends its name to Udupi cuisine which is famous across the world. Next morning visit an elephant training camp in Gajnaur and the jungle reserve of Tyavarekoppa Reserve to spot tigers, deers and sambhars. 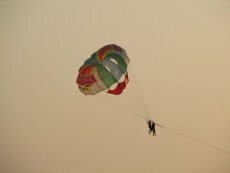 These tours represent our ideas and recommendations and is a glimpse of the astonishing ways you can discover Goa. If you have any thoughts, stirrings or feedack, do get in touch. Together, we can personalise your trip and make it a memorable experience.